The New York City Marathon took place yesterday, with Geoffrey Mutai, the Kenyan man who made headlines in Boston earlier this year, winning the whole damn thing with a record-setting time of 2:05:05. Firehiwot Dado of Ethiopia was the first woman to cross the finish line, in 2:23:15. 46,534 other individuals finished the race, and they came from all walks of life. That's the beauty of a marathon, really. All sorts of humans compete on a level playing field: world-class athletes and ambitious common folk sharing the same pavement; celebrity chefs and mere mortals in lockstep. Imagine that. Thousands of unfamiliar faces (well, they're familiar to somebody) competed and finished, with a few recognizable ones peppered in there. Chief among them, for our purposes, was Mark Messier. The Rangers great crossed the finish line with a time of 4:14:21, raising money for two excellent charities — Tomorrow's Children's Fund and Answer the Call — in the process. 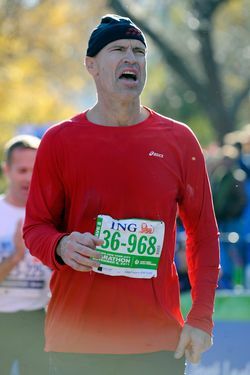 Messier reportedly wobbled a bit toward the end and headed to the medical tent after finishing, but he got the thing done and that's what counts. As ProHockeyTalk notes, he can now lord his time over former teammate Adam Graves, but, alas, not Mike Richter, who finished in under four hours in 2007. How does Messier's time stack up against other celebrities? It's worth looking at those times, then scrolling back and peeking at the winners' times again. Good LORD. Also, I highly recommend reading about João Silva, the war photographer who finished in the handcycle division after losing both his legs to a land mine in Afghanistan last year. Meanwhile, if it's stamina you're looking for, look in a mirror. It's been over a day since the marathon began, and you still haven't crossed the finish line. You've been MARATHONING for OVER 24 HOURS! What endurance! If you're not buying that, go here to check if anybody with your same name finished so you can claim their time as your own.